I have been busy with other things but I saw that the official May temperature figures are out. So I thought I dive into it. 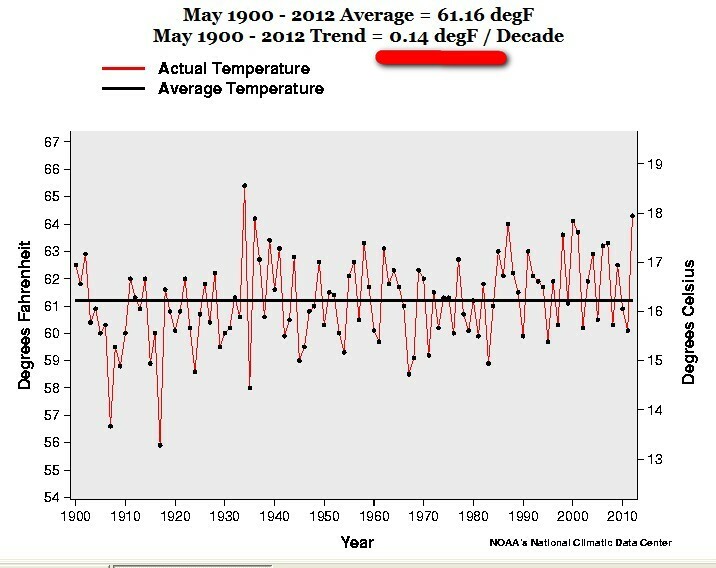 As usual I thought it would be interesting to look at the recent May US temperature from a “historic” perspective. To see how the decade trends have evolved during the last 112 years. So the “warming trend” 2000-2012 for February is exactly – 0.78 F degrees a decade. That is a – 7.8 F COOLER in 100 years. That’s what I call “warming”! 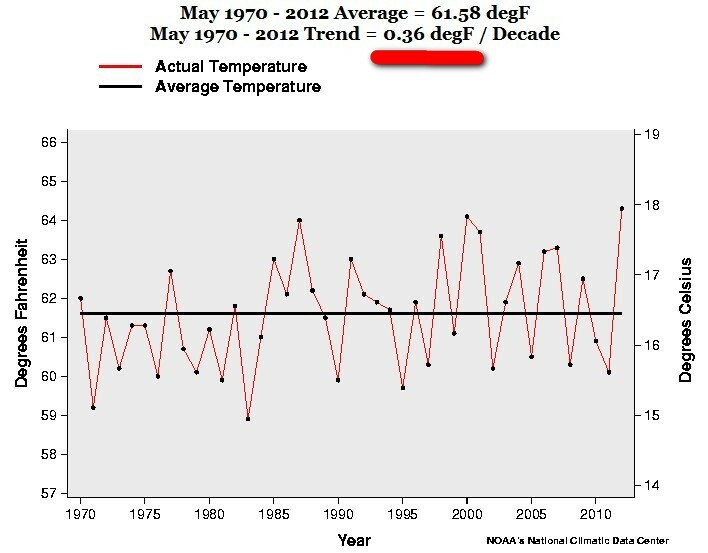 The May trend 1970-2012 is exactly 0.36 F degrees a decade. 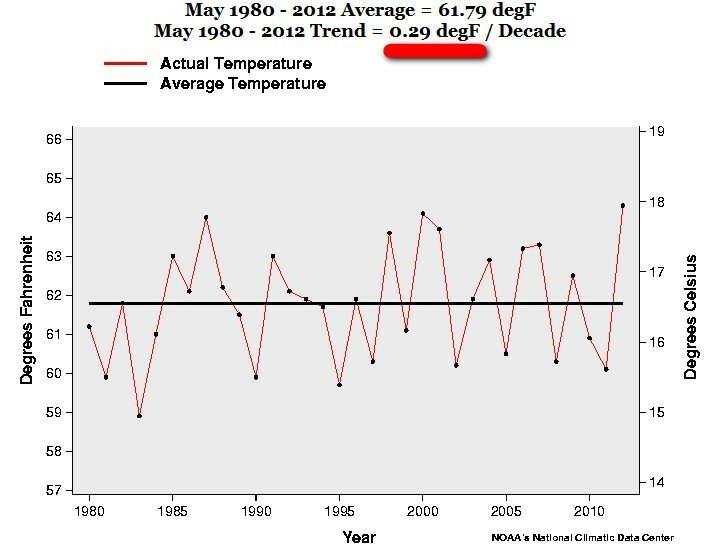 The May trend 1980-2012 is exactly 0.29 F degrees a decade. The May trend 1990-2012 is exactly 0.30 F degrees a decade. 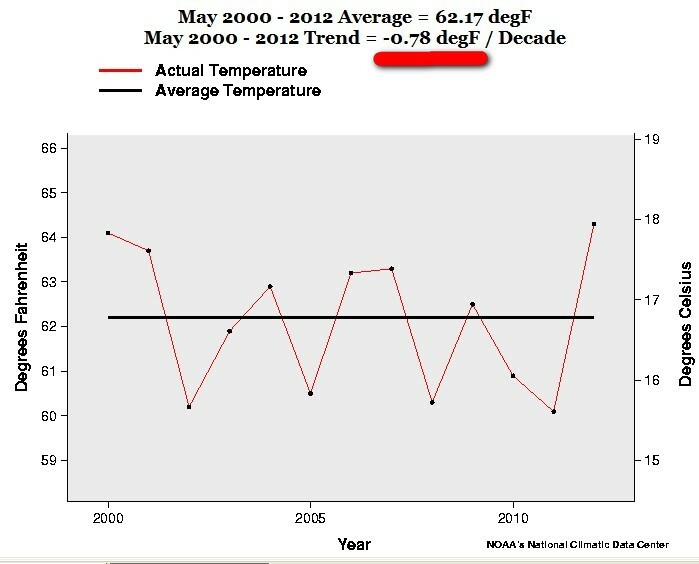 The May trend 2000-2012 is exactly – 0.78 F degrees a decade. This entry was posted on 9 juni, 2012 at 11:36 e m and is filed under Fri- och rättigheter, Miljö - Environment, US Temperature, USA, Yttrandefrihet. You can follow any responses to this entry through the RSS 2.0 feed. You can leave a response, or trackback from your own site. on your publish is just excellent and i could think you’re a professional in this subject. Fine together with your permission allow me to take hold of your feed to stay updated with forthcoming post. Thank you one million and please carry on the enjoyable work.